-- from Adrienne Rich's "Diving Into the Wreck"
Adrienne Rich in 1987, around the time I studied with her at Stanford. I'd like to imagine that this is Adrienne's Stanford desk. Diving down into darkness, I often do forget ... why I've gone there, or come. How do we "forget" -- or "remember" -- what Zora Neale Hurston writes is "the dream" of women? 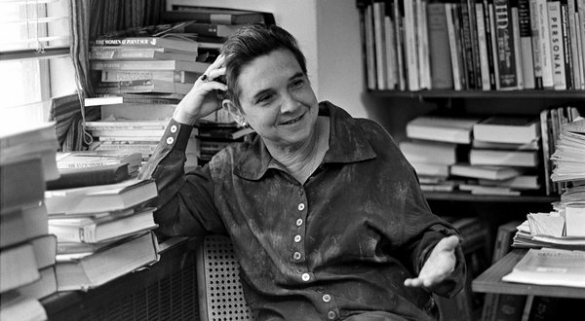 It is with sorrow that I have learned of Adrienne Rich's passing this week, in Santa Cruz, California, where she lived, I believe, since she moved to Santa Cruz in the 1980s, when she came to Stanford University, my alma mater, to teach. I remember Adrienne's "coming." I was a graduate student studying feminist theory, and I was quite excited that such a leading light in my field of study had been hired to join the faculty. I remember clearly the unusually difficult process I had to undergo to apply for her course in Feminist Theory. I was one of the 20 accepted, although not number one on the list. I knew I was a little too "academic" for the activist poet and essayist Adrienne Rich. I was not a regular reader of On Our Backs, instead preferring to read Roland Barthes, Julia Kristeva, and Luce Irigaray's Lacanian feminism. It was my second or perhaps third year in the doctoral program there when she arrived on campus. By that time I had been battered by canonical-book reading lists and rite-of-passage exams and the required study for my doctoral degree in contemporary literature of Anglo Saxon -- and this ancient high-German language was not my metier at all (although I did write a paper that I was proud of for that course, arguing that the "Battle of Maldon" -- in its disenchantment with and cry of pain over war -- had to have been written by the women left behind by embattled Anglo Saxon war chiefs, whose dead bodies sprawled over bloody English fields). I myself hungered for something I had left behind -- a women's collective -- in my earlier study of feminist theory at the University of Arizona, where I had finished my M.A. a few years earlier. There, in Tucson, a group of us met "secretly" in Sapphic academic study, a group that included many now luminous women in feminist theory and poetics -- Susan Hardy Aiken and Barbara Babcock (the latter the famous folklorist), Cynthia Hogue, Karen Brennan, Nancy Mairs, and so many others. Stanford offered enormous educational opportunities to me, but it seemed so ... well, Silicon-Valley-ish, then draped in its '80's early .com wealth. Computer chips reigned the day -- certainly not women poets and activists. And I was a single parent who was also a graduate student, a strange phenomenon to most in my era and place. I was living below the poverty line in a rich "village," although my literal poverty was one masked by student scholarships and women deans who would award me money for my son's dental work. I walked that line tensely, delicately. My son and I often felt ready to fall into the drift of the San Andreas Fault, or into the sea. I was in a state of near falling-down ... into the abyss, or wreck ... when I walked into Adrienne's first -- now legendary -- feminist-theory class. For a first time in a college classroom I sat in a circle of mostly women, and with a professor who was openly lesbian and a well-known political activist. There were male students in the class, too, a handful. Adrienne loved women but also cared for men -- as she did her own sons (she was the mother of sons). I remember the delicate way in which she made the young men who came to this feminist theory class of the 1980's welcome, took them aside for particular consultations about their work and views. And the women .... I will never forget the way in which they laced their analyses of lesbian continuity and compulsory heterosexuality (Rich did include some of her own essays into the fold of what we read that heady semester) with equally rich analyses of why the women in their families fight over the mother's china. They expressed with passion the heart-ache of sexual harassment, the devaluing of what Patricia Hill Collins calls "motherwork" in our society, the hiding out in bathrooms of battered women to write a poem, the ignorance of "white feminists" towards women of color, Jewish women's feminism, gay women's feminism -- and the ignorance of most of us pursuing academic pathways during the Reagan Era. We spoke of the terrible misunderstandings about "femininity" and women's enormous but often shattered creativity in our cultures. I talked about trying to raise a son alone, without court-awarded child support -- because the court system didn't care about laws on the books to protect children. Adrienne urged me to take my pain outside myself, and use it to see -- to "re-vision," to use the term she wrote famously about -- the larger world of all women and oppressed social groups. I remember one specific day leaving this weekly seminar in a daze. It was a lovely "daze, " a generous fog, on a sunny northern California afternoon. I walked by the enormous metal fountain that still spills its water in non-drought years outside of Stanford's Green Library. I do not think that I was at all admiring this pastoral West-Coast campus, however, where the red-tiled roofs legendarily were designed to be a heaven-bound signal for a young son, one who had too early passed and in whose honor bereaved parents built this enormous academy. Instead, I sat down on a bench -- bewildered, that finally inside this academic institution of competition and great mental acuity but lacking the body (of) / human passion / feeling that I myself could feel (passion) again. It was pain, I felt, for all that was lost, and re-imagined. Desire. Opening. Expression. Self-expression ... that was what Adrienne was truly good at: expressing herself. Opening up the capacity of others -- to express themselves. It was Adrienne who looked at me one day at the Stanford Institute for Women and Gender -- I think I was sitting in her office, one that looked a lot like the one published in the New York Times photo, and she said: "I want you to become the Director of the Graduate Women's Network." So I did. I guess no one else wanted the job. And thus our graduate women's collective put on a marvelous two-day conference that year, which embraced our fantasy: it was called "A Feminist University." Catharine MacKinnon was our keynote speaker. Women from across the Bay Area drove over multiple bridges to be there. We had little money but we made it work. And for those days, we imagined what the academic institution might look like, if it incorporated the dialogue and wishes and dreams of women of diverse backgrounds. One time I told Adrienne, "I don't know how I can contribute." She said: "One day you will know. It has to come from within." Adrienne, I believe at that moment, set me on a better path. I know that long before I was hired at City College of New York in 1991 as a young professor, Adrienne had been an inspired and inspiring teacher of English at this institution. In 1972 she wrote about teaching at CCNY, in an essay called, "Teaching Language in Open Admissions," dedicated to the memory of Mina Shaughnessy. Shaughnessy herself had been a great CCNY teacher, who lead the way in the pedagogy of teaching students of all economic and ethnic backgrounds to write. Her most famous book is Errors and Expectations, and she along with Adrienne and others in that ground-breaking era promoted and developed CCNY's famous Open Admissions policies in an urban-college context. Alas, I never knew Shaughnessy -- she died of cancer at a too-young age. Nor did I work with Adrienne in this context. Open Admissions is long gone. So are the kind of writing programs that Shaughnessy and Rich championed and kept alive. Times change. People change. Things change. I wonder whether or not Rich would approve of where her old -- my current -- department has gone in the last decade. I lost touch with her, and never asked. It is curious to me that she and I both have inhabited these dual-coastline academic "spaces." Inhabit, I say, because I myself feel like a ghost of some long lost era. The values and lessons I absorbed from Rich -- which she literally passed on to me, gave to me to incorporate into my intellectual and moral passion -- seem so lost among the power elite, both within New York City and the country, as well as in my little corner of an urban college. In my corner, too many women are fighting over momma's (broken) china, and positions too recently held by only men in a legendarily patriarchal college. And too many men turn their own look away, or backwards. And we all turn together into pillars of salt. Laura, this is very moving to read. Thanks for writing and posting it. I saw Adrienne Rich read from her poetry in Madison and later, on September 12, 2001, after she had traveled from Missouri to the University of Minnesota to read, despite our national catastrophe the day before, a long poem about the first Gulf War that she wrote in 1991. One of my own mentors in Madison, the scholar Jane Vanderbosch, tutored me in Rich's poetry at the feminist housing coop where we lived in 1982. Jane died near the age of 55. Her dissertation on the education of Adrienne Rich is housed at the Beinecke.